You know the feeling, you just got home from another grueling day at the office, or you're stuck at the airport for yet another layover, or maybe you just got dumped again! You just want to relax and enjoy yourself for a change. What you need is some serious deep dungeon delving. But you don't have time for memorizing complex skill trees, crafting charts, or upgrade scales. That's not to mention sitting through ceaseless cut scenes, endless dialogue trees, or boring tutorials. No worries! Instant Dungeon has got you covered! Just choose from one of the nine unique flavors, press go, and presto! 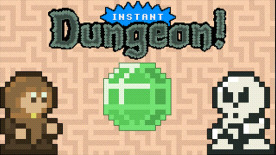 Instant dungeon will instantly create a new dungeon just for you! Complete with glittering treasures, vicious monsters, brutal boss battles, wild power ups and most importantly fun, Fun, FUN! Instant Dungeon! mixes dungeon exploration with arcade action in the vein of the classic maze games from the 80s (eg. Pacman, et. al.). A different dungeon every time you play! Nine different game flavors to choose from! Collect treasures and glory in Action Recipe! Enter the service of the King in Adventure Mix! Save your friends in Rescue Relish! Plumb the dark depths of the dungeon in Dark Roast! Explore in utter darkness in Soul Succor! Survive brutal boss encounters in Boss Blend! Hone your skills in Practice Formula! Simmer down with Weak Sauce! And test your sanity in the mixed up world of Maxima Mash! Eleven lovable player characters to choose from! Sixteen wild weapons and spells to collect and conjure! Procedurally layered music, a different soundtrack every time you play!